The ZehnKatzen Times: [logo] Toronto Turns Over The Old Leafs … for a New Old Leaf. 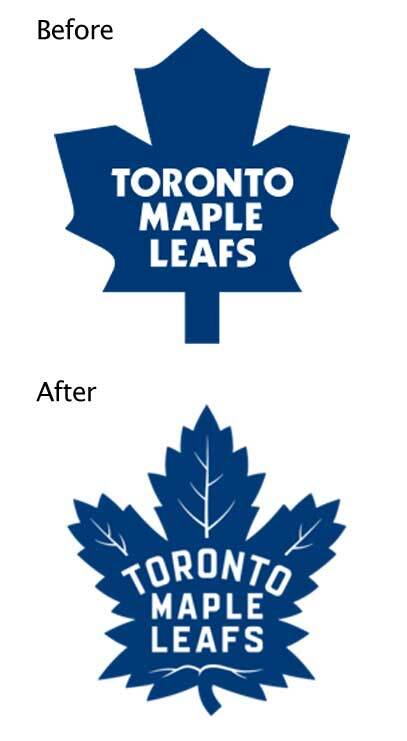 [logo] Toronto Turns Over The Old Leafs … for a New Old Leaf. The Toronto Maple Leafs are (is?) one of the oldest, most legendary teams in major league hockey in North America, with a history stretching back a century (as of next year). It's hard to argue with 13 Stanley Cups. But the last Cup win was back in the 1960s; the dynasty days are far back in the rear view. And the logo is a hallmark of 70s design (reminds me of the uniform of the Houston Astros of about that time). It wasn't badly designed, but the simplified maple leaf outline seems to recall avocado kitchens and AMC cars more than a historically beloved hockey team (see above right). The organization has met the challenge with that evergreen of solutions, a logo redesign. To summon up the glory days, they've reached back in that past, and come up with a new logo that looks more or less like the old one. Which isn't a bad thing, really; with an updated typeface and more attention to type layout, it's a well-done homage. If if it suffers from anything, it's a bit too much leaning on everything having to mean something. According to this article on the CBC's website, there are 31 points for 1931, the day their original arena opened; 17 veins total, for the year the club was founded (1917), and 13 veins above the letterforms, for the 13 Cup wins. Give it credit for trying very very hard. It may have tried a little too hard, though; the style of the veins in the bottom of the leaf has invited comparisons to the derriere. Well, if that's true, at least it's a logo you can get behind, so to say. [logo] Uber's New Look Is Very Nice, Thank You.